Hattrick Supporters have access over a wide range of statistics for teams, individual players, matches and just about anything else that has any statistical meaning. Where supporters have no real in-game advantage over non-supporters, some claim that supporters stats do yield a small advantage for supporters, because these stats can sometimes reveal smaller differences than match ratings or stars. Supporter statistics are often referred to as sup(p)stats. The statistics are divided in 2 categories: Team statistics and General statistics. An overall summary of you players. Here you find the total TSI, average age & TSI, average form and experience, number of players and nationalities. Here you get the 15 best matches in your teams history, based on rating. Also your teams best 15 defence, midfield and attack ratings can be shown. This section shows the best 10 games of everyone of your players. Also their the 10 best games for all teams where they played before can be shown. For some reason the last 3 can only be shown for the current season, all others can be shown for the whole team history or every season apart. Here you can find a summary of all goals, injuries and cards for each season. This part shows the minimum, maximum and average of spectators for each section of your stadium. And an overview with several averages for every country (or division within a country). For example the average money, fanclubsize and wages for Englands 3rd division. A top-20 for every country of national team players with the most caps. With the possibility to show all players with an NT or U-20 cap. 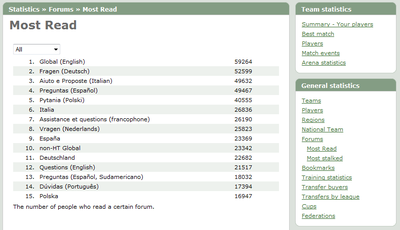 A top-15 of the most popular forums. Seperate highscores for federation, national, regional, non-HT and series forums. 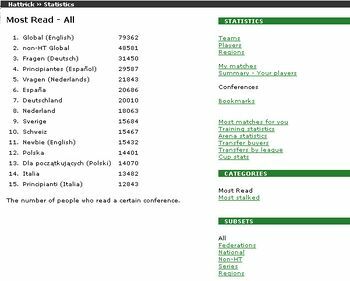 The 15 most bookmarked users, teams and players for every country. An overview of all trainingtypes and the percentages of teams using them in each country. The 15 teams who spent the most, or did most transfers. An overview of all countries and the number of transfers their teams have done. With average price and TSI. This section shows which divisions are still represented in the national cup. Some stats about your federations. This includes teams with the most victories or undefeated games, number of teams for each league level, gain/loss of fed members last month and the nationalities represented in the federation. This page was last edited on 16 May 2012, at 17:18.